Occupy Wall Street got almost no press in its first week. Then the NYPD was caught on tape macing two young women, the number of arrests climbed, and suddenly OWS was on the map. This past weekend, the NYPD continued to do its part, by arresting more than 700 people as the protest marched over the Brooklyn Bridge. There is controversy about whether or not the police actually led the protestors onto the roadway and then began arresting them. What actually happened is still very unclear, and likely to remain so. 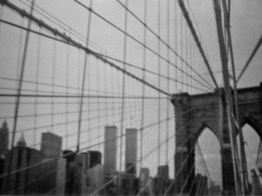 Photo: Brooklyn Bridge, circa 2000, by Frank Feery. All of this happened over the weekend, when the moon was in Sagittarius, and making generally harmonious aspects. We were building towards a Mars-Jupiter square on Sunday evening. Take it all together, there was a lot of powerful, idealistic energy around for the past few days. And as upsetting as the story is (no matter which side you take), it's clear that things could have been worse. Today, the moon goes into Capricorn. Since at least mid-August, every time the moon has gone into a cardinal sign, there has been a heating up of the Uranus-Pluto square. The London riots, the panic over hurricane Irene, and the execution of Troy Davis all took place when the moon was in cardinal signs, as examples. Monday and Tuesday are likely to be tense days. On Wall Street, the protestors outside may not be making as much of an impact as the Greek debt crisis has inside the stock exchange. The Uranus-Pluto energy amps up all sides of the equation, pressure from within and without. Uranus in Aries highlights individual rebellion, but is also associated with rebel groups (Occupy Wall Street and the Tea Party share the same frustration, from different perspectives). Whether the rebels are freedom fighters or terrorists depends mostly on your own point of view. Whether clamping down on them is restoring the rule of law or oppressing the people is also a matter of your attitude. As the status quo becomes harder to maintain, both sides will push harder. Keep your eyes open over the next few days. The revolution may not be televised, but it is probably going to be on YouTube and Facebook.